In the 1000 piece jigsaw puzzle, Christmas Traditions by White Mountain, a collage following a family through their Christmas traditions is depicted. In one scene, the family drives away from a Christmas tree farm in a vintage, turquoise car with a tree strapped on top. In another scene, the family of four sing Christmas carols in the snow. While the boy feeds his dog some of the dough, the mother and daughter continue to cut cookies in another scene. Santa also appears on this puzzle, holding the daughter and son in his lap while they tell him what they want for Christmas. 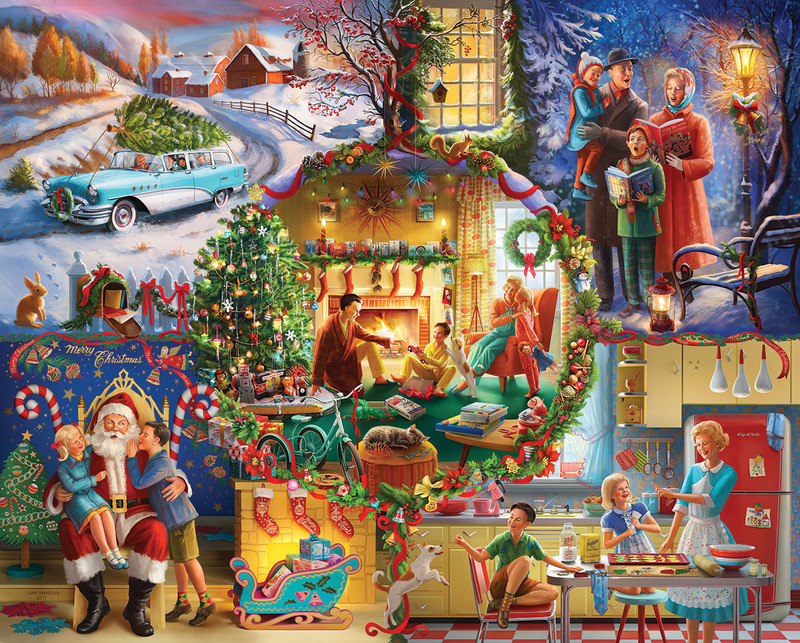 The final scene that happens to be in the center of the puzzle depicts the family opening presents on Christmas morning. This puzzle is a great gift during the holidays! This was a five star puzzle for me. The picture is delightful, the colors are bright and lively, and the lines are clear. The five vignettes depict Christmas traditions in 1950's style, but still relevant customs today. The pieces were of a comfortable thickness and the fit was excellent. It was easy to move sections of eight or more pieces into place without any falling apart. In fact at the end I could pick up a corner of the puzzle and lift a quarter of the entire puzzle without any falling apart. But it was not difficult to separate the pieces when I put the puzzle away. It's a lovely picture and I will enjoy doing it again for another Christmas season. I also found it easy to find where specific pieces belonged and this made a very enjoyable puzzling experience for me. This puzzle also had very little dust and only a few sets of pieces that were not completely separated. I like this puzzle for the retro images. White Mountain is becoming a favorite brand!